Normally developers make a big deal about showing off their games at PAX. Jonathan Blow did the opposite. Braid developer Jonathan Blow doesn't just make games, he also makes games out of showing off his games. Rather than take the oft-traveled route of actually telling people that his next title, The Witness, would be shown at PAX 2010, he tucked it neatly away in a booth shared by two other indie developers and told no one. 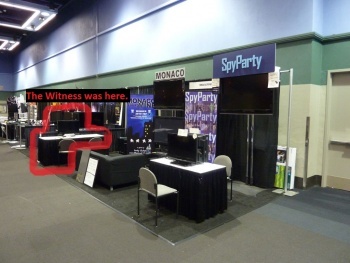 The Witness was a secret third game hidden in the Monaco and SpyParty booth. There was no signage notating its existence, though Blow was often lurking nearby. The Witness has been somewhat of a mystery but is described as an exploration-puzzle game that takes place on an island. As the next project from the creator of Braid, there were probably plenty of PAX attendees that would have loved to see the current state of The Witness, but Blow had a few reasons to keep the showing a secret. He writes: "At a show full of companies trying to capture your attention and sell you things, I wanted to do something that is subtle, and a surprise - if you notice it, and decide to investigate, you find something unexpected. "Also, I wanted people to be able to play the game for as long as they want, not feeling pressured to stop playing because of a huge line of antsy people waiting behind them," he says. In a way, the PAX Witness secret was also a way for Blow's development team to get outsiders to test the game with a completely open mind, not knowing what it was or who it was created by. He continues: "Before PAX, only two people had ever played the game; those people were game developers, and the versions they played were very rudimentary. This was the first time the game had ever been played by general players, and I wanted to see how people would react to it, as honestly as possible." Blow was happy with the reception, saying that no unexpected issues arose, and that some players even stuck around to try The Witness for over an hour. "The game does work as expected, despite being kind of crazy and experimental, and people enjoy playing it," he revealed. "All that's left now is just to do all the hard work required to finish the game!" I know I've been antsy to find out more about The Witness, but I'm still not 100 percent sure I would have found it at PAX. It was probably a nice surprise though, for those that knew what they were looking at.